Thesis (Ph. D.)--University of Chicago, 1921 "Private edition, distributed by the University of Chicago libraries, Chicago, Illinois." 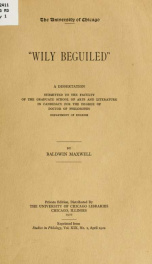 "Reprinted from Studies in philology, vol. 19, no. 2, April 1922."